B One & Ride the HORSE on the SHORE. 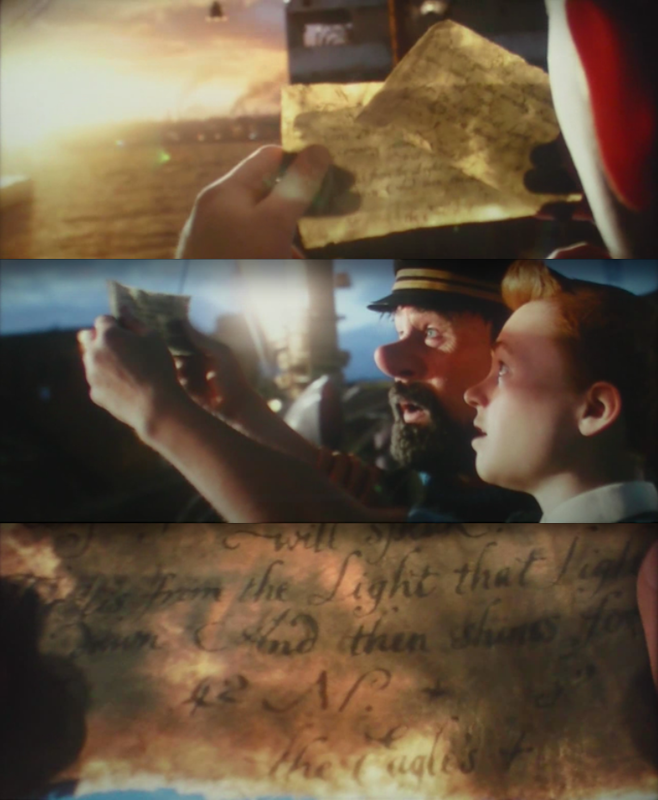 Tintin and Haddock discover the secret of the unicorn, 42! 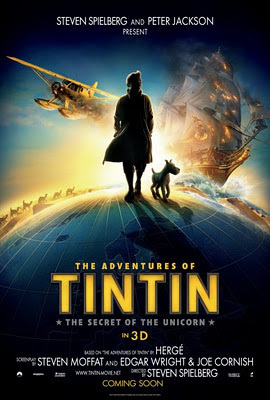 In "The Adventures of Tintin: The Secret of the Unicorn" Tintin & Captain Haddock are questing for three scrolls needed to unravel the mystery of the sunken Unicorn ship. 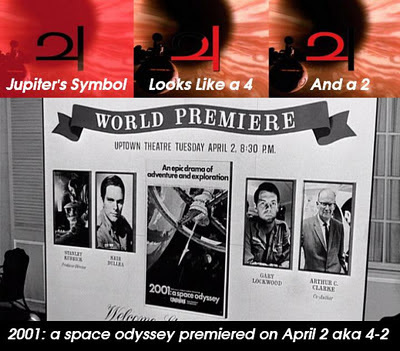 The final clue is found when they notice the scrolls align creating coordinates, the most prominent and clearly visible being 42. The ancient symbol associated to Jupiter (above), used in astrology & astronomy, can be unpacked as a 4 & 2. Perfectly entrained this is also the symbol used for element number 50 aka Tin. Tintin is thus a potent Jupiter resonator. At one point Haddock has an alcohol detox and thirst induced vision in the Sahara. Behind him Tintin's dog Snowy is dragging along a giant bone. He sees a ship ride over the dunes, turning into the waves of the ocean. 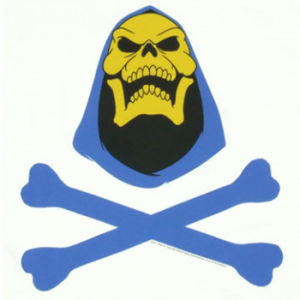 This is how he remembers his destiny as one of the three sons who are keepers of the three scrolls that combine to form 42. After his revelatory vision he exclaims "By Jupiter, I have a beard!" 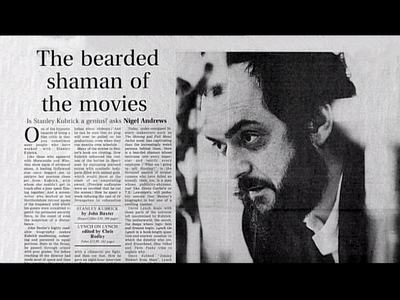 Yesterday I started watching a documentary called "Kubrick: A Life in Pictures". It features the famous bone "match cut" scene from 2001: A Space Odyssey. 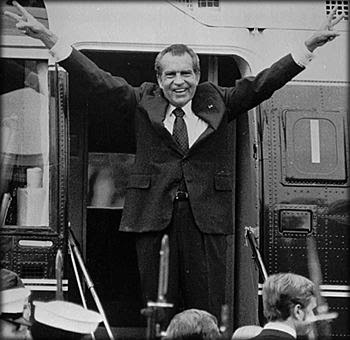 A primate human throws a big bone in the air. 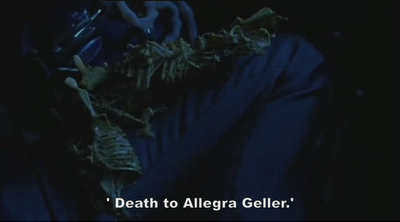 As it falls the film cuts to a similarly shaped space craft. 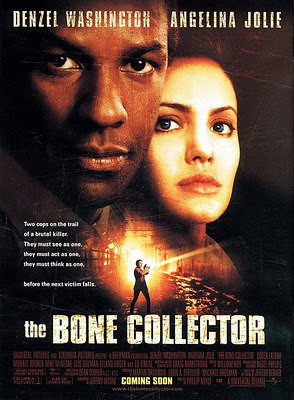 In this one cut the entire evolutionary process from primitive tools, like a bone club, to space fairing ships is suggested. Humans have made it to space and we have one more trip to take. 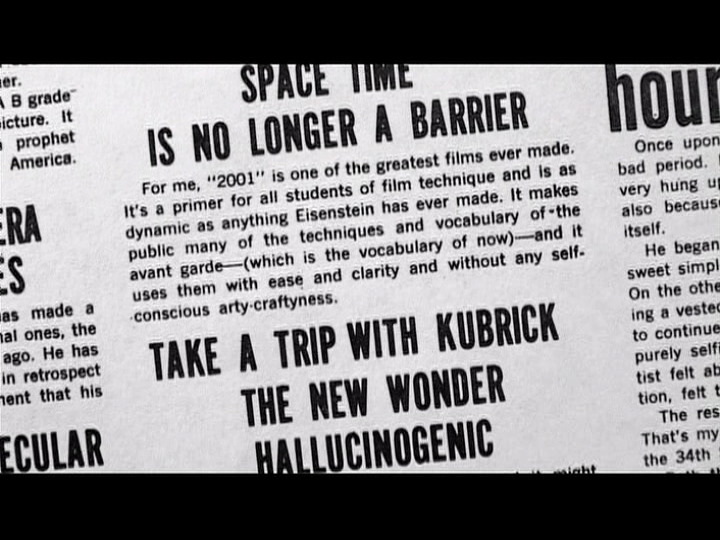 The documentary talks about the polarizing affect Kubrick's revolutionary films like 2001 had on critics and the public, explaining how people got up and left during its premiere. We notice the date of the films premiere was April 2 or 4-2. Perfect entrainment for a film all about Jupiter. Further Jack Nicholson (who worked with the director on The Shining) recounts that Kubrick told him "241" people walked out at 2001's first screening, "I'm sure he counted them too" Jack quips. 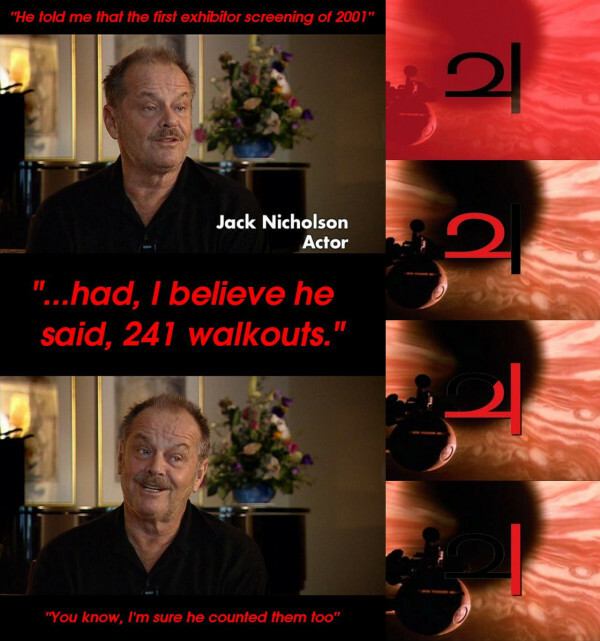 241 is another way of unpacking the Jupiter symbol. Yesterday, Dec 28 was Denzel Washington's birthday who stars in The Bone Collector. 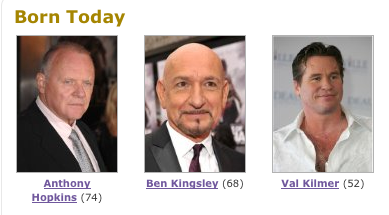 Today, Dec 29, is Jude Law's birthday. Above on the eXistenZ poster he wields "the bone gun". 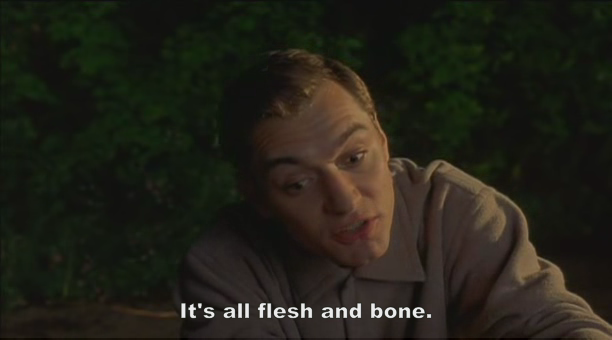 I like how Bone tells us to B One as in "Be One". 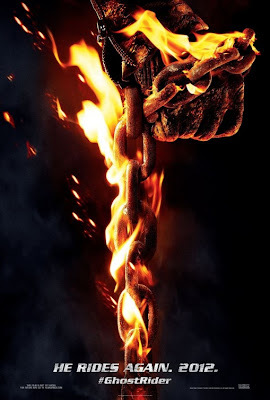 Alan Green mentions a great sync with Contact in the comments of this post. 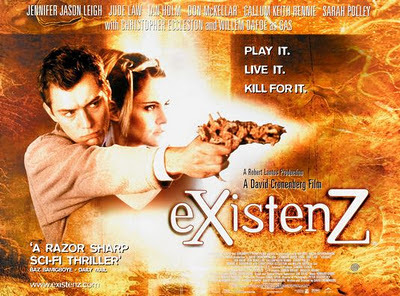 In the film Jodie Foster as Ellie Arroway finds an extraterrestrial signal beamed to Earth. 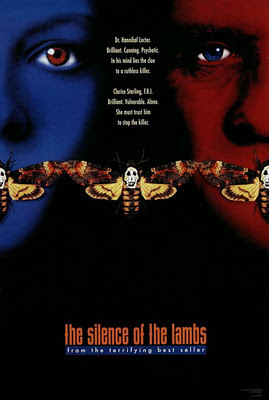 John Hurt plays the eccentric genius billionaire Hadden who has decoded the transmissions from the aliens. The key he realizes is to take three pages and align them in 3 dimensions. 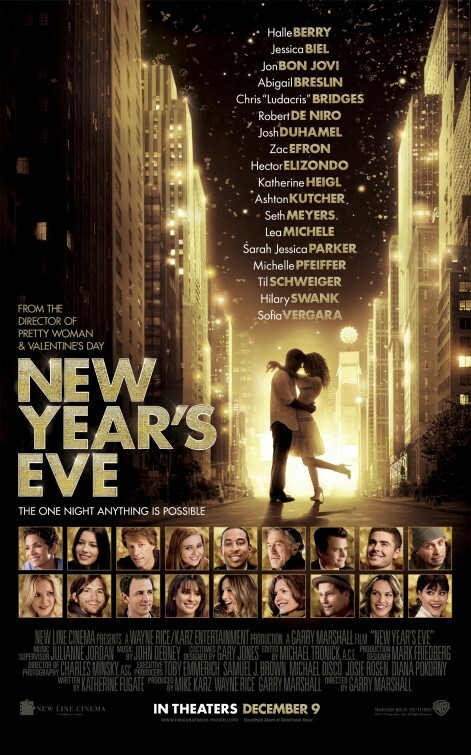 This is very similar to the scenario of aligning the scrolls in Tintin. Once this is done the alien transmission is revealed as a blueprint to build a transportation machine. 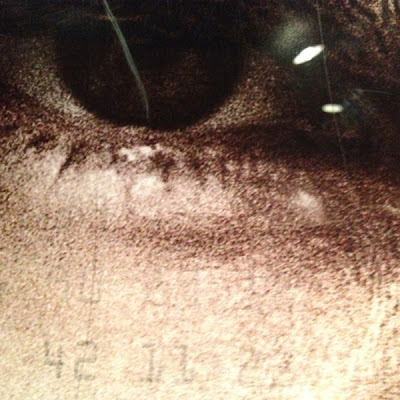 This takes Foster to a beach where first contact is made with other life forms in our universe. The beach is by the shore and shore is an anagram for horse. First contact is also the scenario in 2001: A Space Odyssey where we need to travel to Jupiter to investigate alien signals. The young Ellie is played by Jena Malone and we see her above asking her dad if they could talk to Jupiter if they had a big enough radio. Above her during this conversation is a Unicorn reminding us of Tintin. Ellie holds up drawing of the shore surrounded by horses. 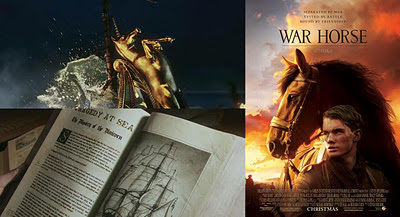 The horse ship above looks like its braking the shore. It was fascinating to go watch Tintin: The Secret of the Unicorn and War Horse in theaters on the same day this past Boxing Day, Dec 26. 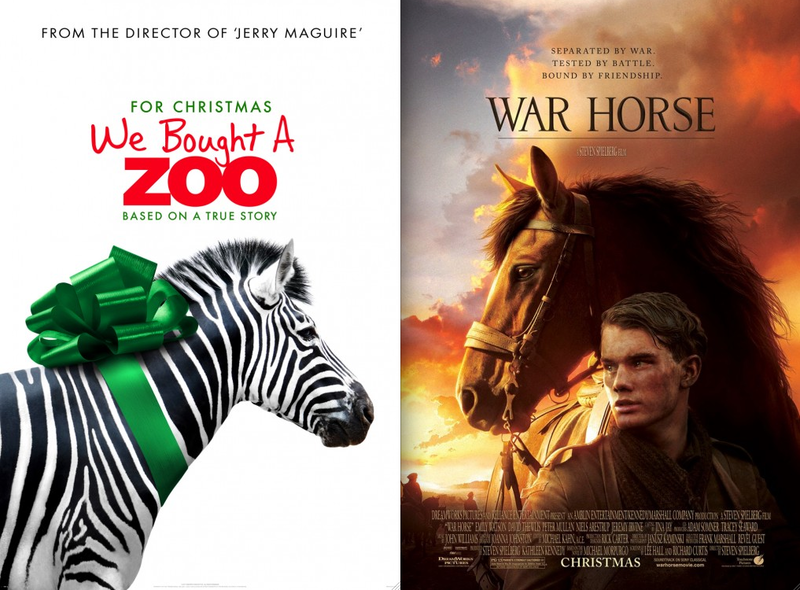 Both films featuring horses, made by Steven Spielberg and released during Christmas... phew. 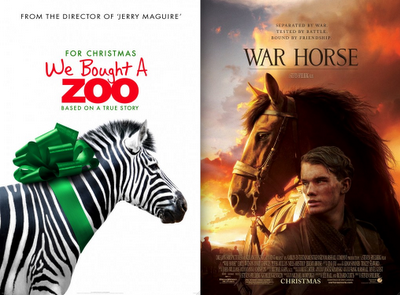 The next day having equines on the brain it occurred that We Bought a Zoo also fits this pattern beautifully. 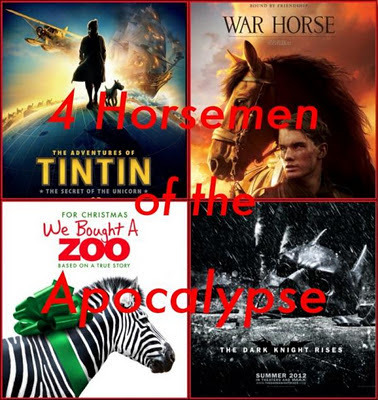 A knight can also be a horse and we have all four our horsemen, ready to ride. Back in November of this year I made this graphic below highlighting the relationship between Sagittarius, Jodie Foster, Jena Malone & contact. Both actresses that play Ellie ARROWAY from the movie Contact have birthdays at the cusp of Sagittarius in November. 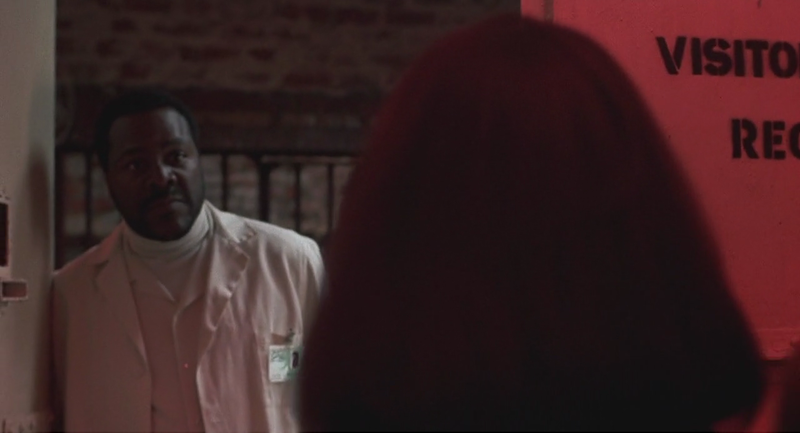 In the movie Contact not only is there a Unicorn behind a young Ellie , but the singular horn (the sync) is pointing to a mobile and specifically the planet Jupiter. Sagittarius as an Arrow shooting Horseman seems to fit well as a type of Unicorn. 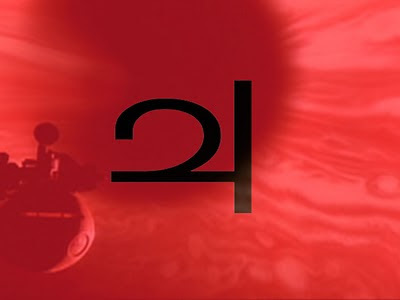 Sagittarius is ruled by Jupiter. 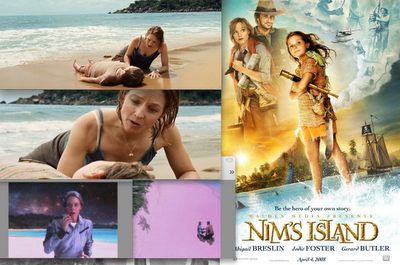 Jodie Foster makes contact on the beach in not only Contact but also the movie Nim's Island. Will add more later flux willing. 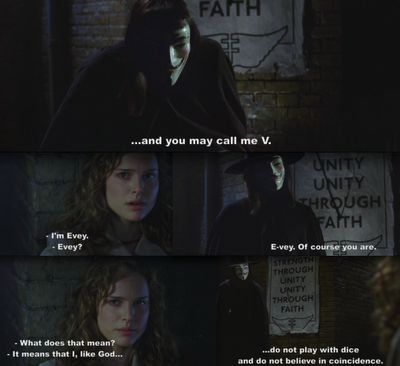 William Hurt, the billionaire Hadden from Contact, also plays the dictator in V for Vendetta with its iconic red V.
When V meets Natalie Portman's character he introduces himself as does she. 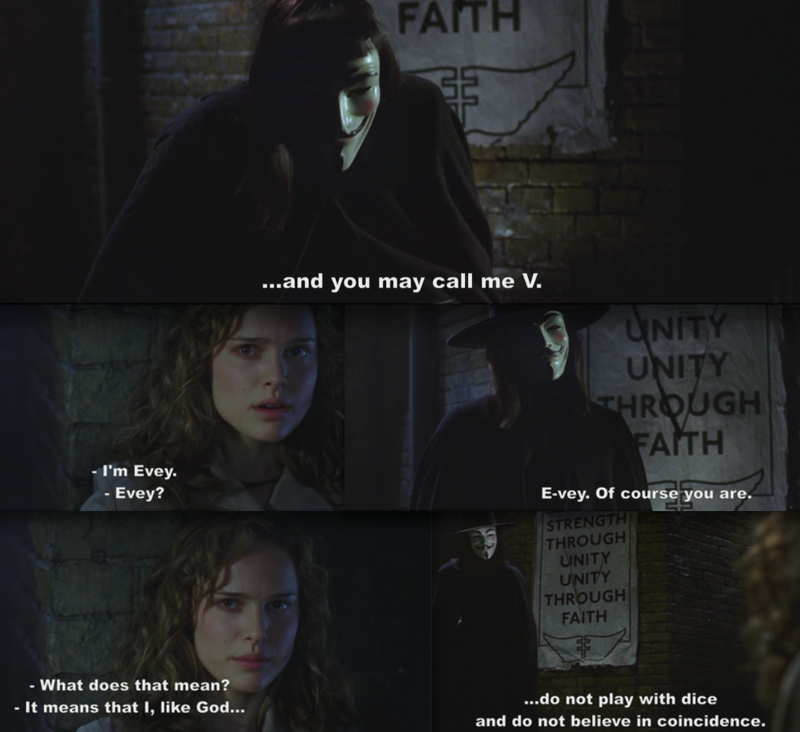 She says her name is "Evey" which V brakes down as "E-vey", seeing some particular significance in her name containing V and further remarking that he does not believe in coincidence. V is in fact seeing and acknowledging sync. Behind him during this exchange we see the V he has slashed into a propaganda poster has framed NIT NIT or TINTIN, remarkable. 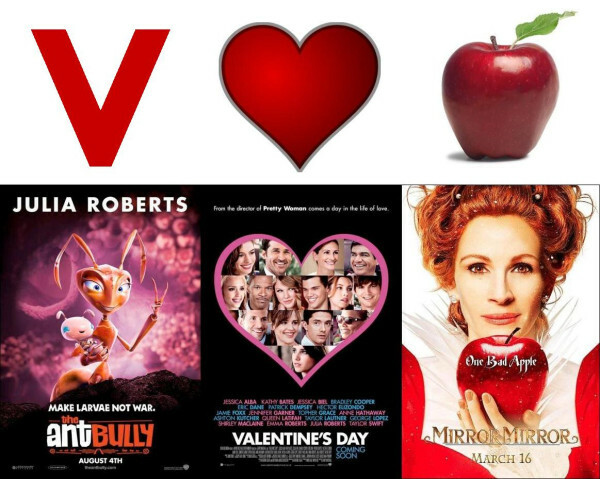 This graphic shows us how V resonates the heart & apple (using Julia Roberts posters to illustrate). The Apple of Eve or Evey and the V go together. 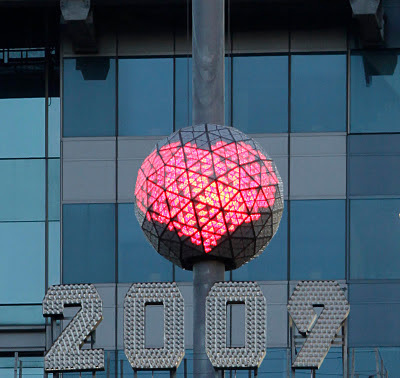 New Years Eve, today, resoantes the V and Apple (of Eve). The iconic heart of New Years Eve celebrations is at Time Square in The Big Apple where a ball is dropped (like the apple from the tree) to mark the occasion. I'm watching Silence of the Lambs as its feel very relevant containing Jodie "Contact" Foster and New Years Eve Birthday Star Anthony Hopkins. Foster as Clarice Starling gets help from Hannibal Lector to find the serial killer Buffalo Bill. 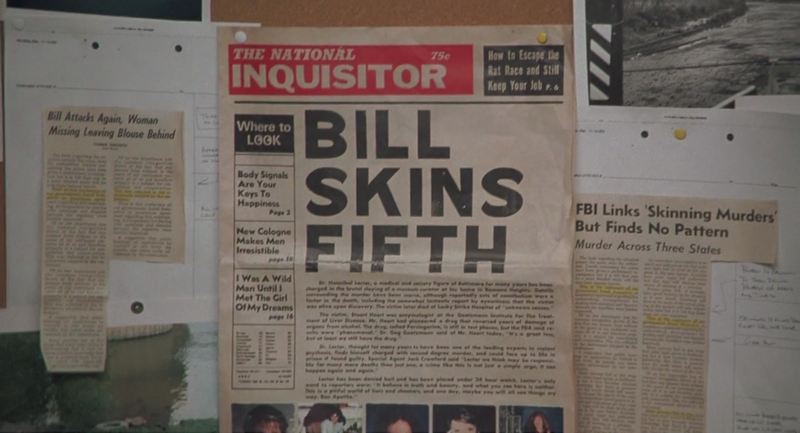 Bill's M.O. 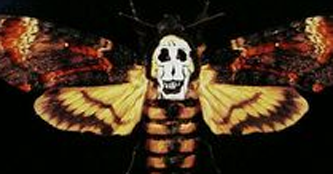 is taking his victims skin. 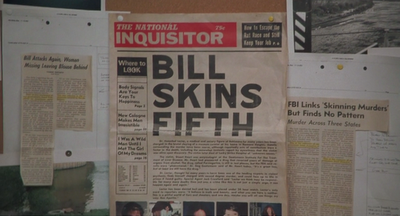 SKIN is an anagram for SYNC and we are introduced to Bill via the newspaper above containing the word "Fifth" or V (Roman 5). 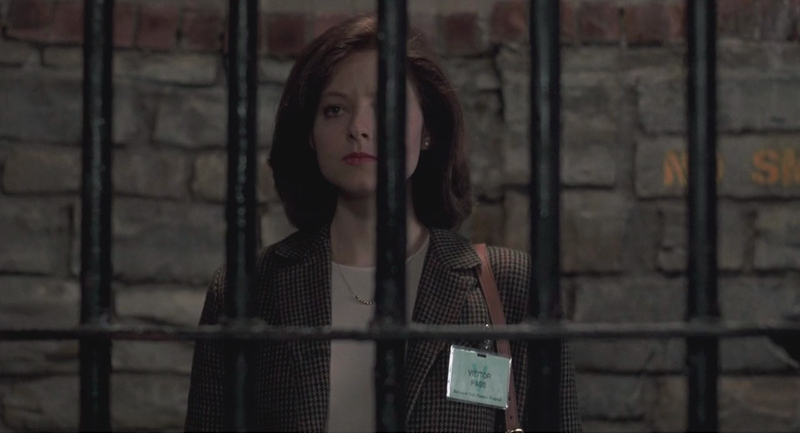 As Clarice (who makes Contact on the shore) apprehensively approaches Dr Lector's (New Years eVe birthday boy Hopkins) she becomes a "Visitor". As we transition into the new year its fascinating to see how well Hopkins, born New Years Eve and Frank Langella born New Years Day entrain. 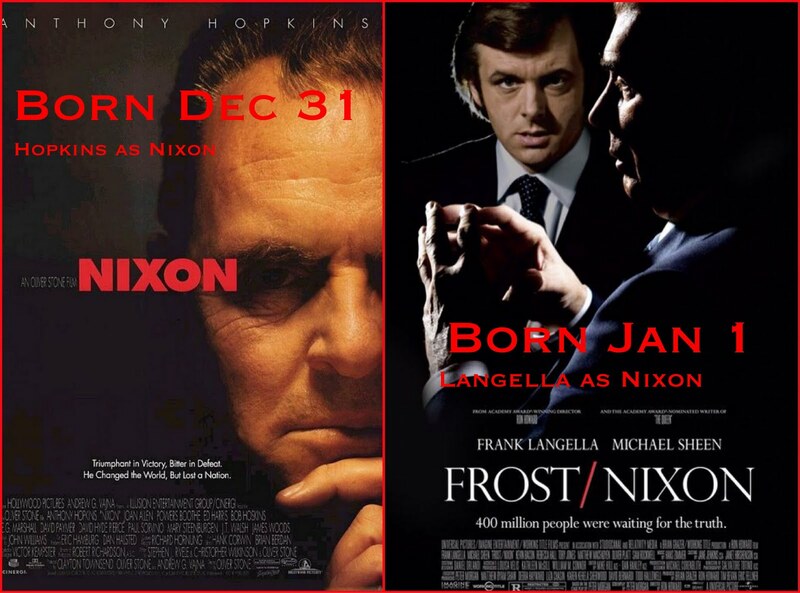 Hopkins is 1995's Nixon and Frank Langella is 2008's Nixon in Frost/Nixon. Another potent sign of the peace coming as the heart aligns with the midnight hour of 2012. 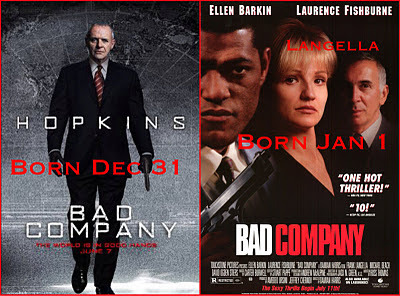 Hopkins in 2002's Bad Company & Langella in 1995's Bad Company. 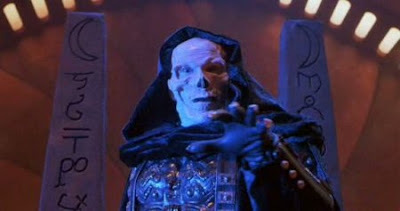 While thinking about Jakes Bone/B One syncs I realised that Frank Langella played the role of Skeletor in 1987 movie Masters of the Universe. 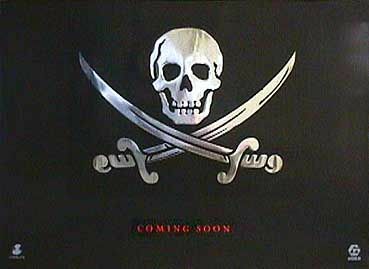 He also starred in Cutthroat Island whose simple poster harks back to his role as Skeletor. Langella contains the word ANGEL which makes me think that the Angel of Death will be overseeing our transition into the New Year. 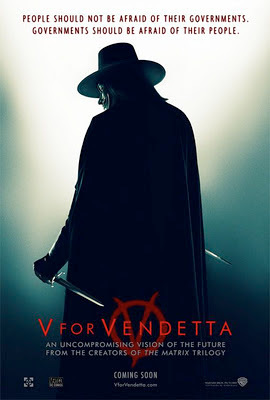 Considering all the apolcalyptic themes surrounding 2012 I suppose he makes for the perfect guide. I just saw Mission Impossible: Ghost Protocol last night. the Stanley Kubrick documentary that Jake mentions above. 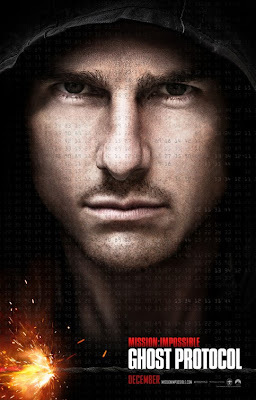 When Ethan Hunt says "light the fuse" at the beginning of the movie it made me think that sync is much like the fuse of Jupiter's ignition into the second sun. 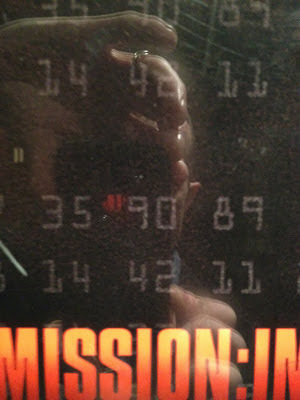 Follow the fuse. Follow the sync..............KAboom! Happy Holiday from the Scarlet Dragon!